House and time at Malvern: Day, 1903 - 1906. Died: 11 July 1915 aged 26 in Turkey. Killed in action at Gallipoli. Son of Major F. S. Picot, Junior United Service Club, S.W. b. 1889. R.M.C. Sandhurst; West Yorkshire Regt. 1908; resigned 1910. School of Mines, Camborne; with Eastern Smelting Company, Penang. Great War, Captain. 14th Bn. Sherwood Foresters (Notts and Derby Regiment). He married Marjorie Putnam on the 29th of November 1912 in St. Jude's church, West Kensington, London, England. They had one daughter, Caroline Fay Picot born on the 20th March 1914. 'After serving in the West Yorkshire Regiment for three years he spent three years at the Mining School, Camborne, and later became a manager of the Eastern Smelting Company, Penang. On the outbreak of the war he served with the Penang Volunteers, but feeling his services would be more valuable at home, returned, and was immediately given a commission and within a month promoted Captain. 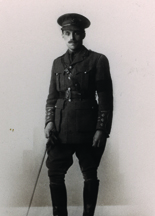 He again volunteered and was sent to the Dardanelles, and fell on July 11 while attached to the 5th Royal Scots.' (Malvernian, Jul 1915). “He was a Captain in the 14th Sherwood Foresters but volunteered for active service, and took out six officers to the Dardanelles. He went straight into the trenches and took over command of the 1st Battalion 5th Royal Scots , which earned great glory with the 29th Regular Division – the Immortals. He commanded the Royal Scots in several attacks on Achi Baba and took and held two lines of trenches though the Turks attacked on three consecutive nights and at the end only 200 men and 6 officers were left. He was ordered to take his battalion on relief out of the trenches to refit and rest on the Beach. He did this safely on 11th July, 1915. On calling the roll he found some wounded men were out in the front. As the fire was heavy and the position very exposed, he said: “I will go out alone and search for them.” He never came back. He was found shot through the head, insensible, and died in half an hour. (Pinang Gazette).